Kelley Dorney was thrilled to be a part of two shows in Musical Theatre Guild’s recent season: State Fair (Margy Frake) and Promises, Promises (Sylvia). She was recently in Oklahoma (Ado Annie) at 3D Theatricals and Carousel (Heavenly Friend) at Musical Theatre West. 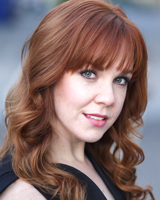 Kelley was also seen in Lend Me a Tenor (Maggie) at La Mirada, Marilyn! (Norma Jeane) at the Alex Theatre, Nunsense (Sister Amnesia) at Crown City Theatre, and in the Ovation nominated ensemble of First Date (Woman #2) at La Mirada. While living in London, Kelley was also in the PBS Concert Special of A Tale of Two Cities as the Seamstress as well as the workshop of Love Never Dies. She can be heard on both cast albums of those shows. She’s toured the nation and the high seas with TheatreWorks USA and Disney Cruise Lines. Kelley continues to perform for kids as part of the Imagination Machine where she encourages reading and writing to students by performing their own creative stories.